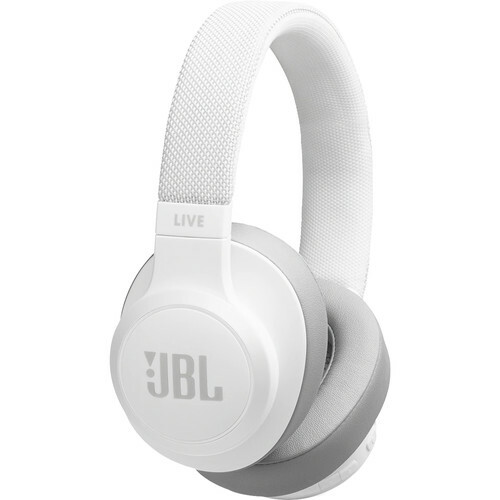 With up to 30 hours of battery life, you can listen to your favorite audio all day with the white LIVE 500BT Wireless Over-Ear Headphones from JBL. Your favorite music is streamed via Bluetooth wireless technology through 50mm drivers that deliver JBL's Signature Sound. Thanks to multi-point technology, you can pair the 500BT over-ear headphones with up to two devices, such as a smartphone, tablet, or laptop, and easily switch between the two when you want. The over-ear headphones also feature a built-in microphone, letting you make hands-free calls via your smartphone, or interact with your mobile device's various digital assistant software programs, such as Google Assistant & Alexa. Use them to send texts, make calls, answer questions, and more; all while your mobile device is safely and conveniently tucked away. Speaking of convenience, the LIVE 500BT headphones features a swivel and fold-flat design that helps to make them more portable and easier to take with you. This technology lets you pair the LIVE 500BT headphones with two Bluetooth-compatible devices, so you can quickly and easily switch between the two. No more re-pairing or a separate set of headphones for the second device. For example, while watching a video on your tablet, you can switch to your phone to answer an incoming call, or while playing a mobile game on your phone, you can easily switch to a video conference call on your laptop. The LIVE 500BT wireless headphones make for an ideal solution to your on-the-go audio needs, but when walking around outside, it's important to be aware of your surroundings. With the touch of a button you can activate Ambient Aware, which lets more outside noise in so you can hear things like announcements more clearly. With TalkThru mode activated, the music volume is dropped, so you can have a quick conversation with others around you, without taking off your headphones. With all-day battery life, JBL has fitted the LIVE 500BT headphones with a fabric headband and soft ear cushions, which are designed to help make them comfortable to wear for extended periods. If the 500BT's battery is running low, you can connect the detachable cable to use them as a traditional set of wired headphones. The cable features an in-line microphone and remote, so you retain the ability to control your audio, make hands-free calls, and interact with your digital assistant. Box Dimensions (LxWxH) 9.0 x 8.8 x 2.9"